Shelley is our Lead Surgery Technician, and has been a member of our LVSC family since 2000. She joined our staff after a 12 year career of owning her own business in turf management. 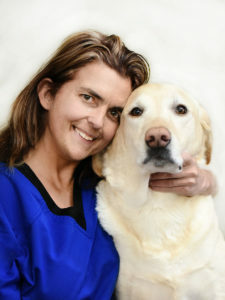 Shortly after starting at Lakes Veterinary and Surgical Center, she soon discovered her true calling as a Surgery Assistant, which she greatly enjoys. Shelley received her Veterinary Assistant certification from Penn Foster College. She is also a certified Veterinary Dental Technician and is a member of the American Society of Veterinary Dental Technicians. Her interests include orthopedics, dentistry, behavioral modification, nutrition (which she eagerly shares with clients) and alternative medicine. When not at work, she can be found relaxing with her husband, Dave, and their dog Maxx, along with his friends Tigua and Pearl. Shelley enjoys camping and fishing with her husband, in addition to tending her many gardens at home. Lapidary arts (polishing and cutting rocks) is her passion.